Check out this video to see an easy way to keep an aquaponics swirl filter (radial flow) clean and other tips on design. I have been running this particular filter for a few months now and have been able to test the design I have implemented. I have been so happy with the amount of solids that are collected by the filter and it has been an excellent source of fertilizer for my garden and indoor plants. It has not been perfect however and I have made some adjustments and additions since my initial setup. The first issue I ran into was an issue with how the solids collected on the bottom of the barrel. When I opened the drain at the bottom only the solids that were close to the drain would be sucked down leaving piles of waste on the bottom of the filter. I have since remedied this by adding a simple piece of garden hose to the drain with a small dowel connected as a handle. This allows me to clean the bottom of the filter with a kind of vacuum, similar to a pool vacuum. This has been working great! Takes me about 2 minutes to clean off the bottom of the filter. Another issue I ran into was with algae buildup on the sides of the swirl filter. This was caused by my nearby grow lights shinning into the filter. Water + light = algae! I have since added some cheap mylar sheets (emergency blankets) to the walls of the grow beds to reflect the majority of the light back into the growing area. This has just about stopped any further algae from growing on the nearby fish tanks and swirl filter. The last issue I had to tackle was with the drain plumbing on the setup. 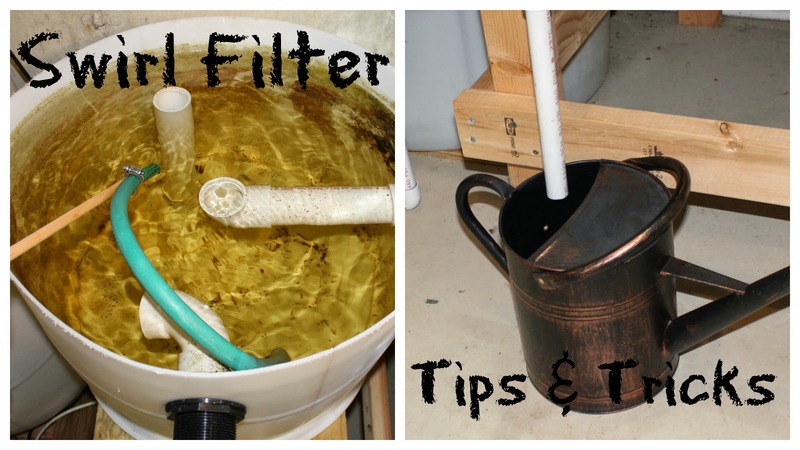 In the summer I was able to come down with a 5 gallon bucket every few days and fill up with the swirl filter waste and take it out to the garden. In the winter here in Michigan I don't have enough indoor plants to keep up with the waste. Although I don't like wasting perfectly good fertilizer I had to implement some plumbing to take the swirl filter waste straight to a nearby floor drain (this goes to our sump pump and is pumped outside). So now I can either fill up a small watering can with the rich fertilizer for some plants or drain it off to waste just to keep the filter clean. The system overall has been working great and with these fine tunings I can now easily clean the filter as well as keep it clean from algae and too much buildup on the bottom. Thanks for your videos. The one on bacteria & their optimal growing conditions was very informative. The 7th video down the list is about DYI Vortex Filter with some nice info.